Orders under 2kg are usually dispatched with the Royal Mail. 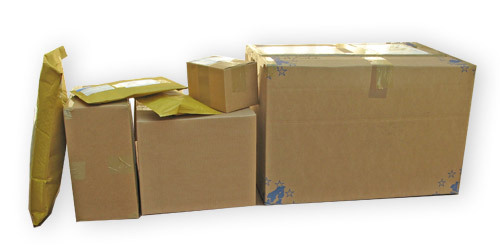 Orders over 2kg or oversized parcels will be dispatched by the most cost effective means. Please note, postage and packaging of Hexon Box sets is different from that of miniatures, as these are dispatched by courier; see below. If your order is lightweight relative to the order value, P&P charges may well be less than that shown below, in which case your P&P will be reduced accordingly. Overseas orders under 2kg are sent using the Royal Mail International Small Packet Post. This is not a tracked or sign for service, If you would like your order sent using the International Tracked or International Sign For service please contact us and we will provide a quote. Please note this will cost more than the standard percentage and will also vary depending on the size and weight of the package. As an approximate guide shipping is calculated on the database at 20% of order value, however if the actual shipping is more than this we will let you know prior to charging your card. Orders above 2kg in weight may incur additional Postal Costs. If your order is lightweight relative to the order value, P&P charges may well be less than 20%, if heavy relative to the order value, it may be more than 20%. As an approximate guide shipping is calculated on the database at 25% of order value, however if the actual shipping is more than this we will let you know prior to charging your card. Orders above 2kg in weight may incur additional Postal Costs. If your order is lightweight relative to the order value, P&P charges may well be less than 25%, if heavy relative to the order value, it may be more than 25%. Orders above 2Kg in weight may incur additional Postal Costs. If your order is lightweight relative to the order value, P&P charges may well be less than 25%. Shipping items half way around the world is not cheap! As an approximate guide shipping is calculated on the database at 25% of order value, however if the actual shipping is more than this we will let you know prior to charging your card. Orders above 2kg in weight may incur additional Postal Costs. If your order is lightweight relative to the order value, P&P charges may well be less than 25%, if heavy relative to the order value, it may be more than 25%. Albaina, Armenia, Austria (EU), Azerbaijan, Azores (EU), Balearic Islands (EU), Belarus, Belgium (EU), Bosnia Herzegovina, Bulgaria (EU), Canary Islands, Corsica (EU), Croatia, Cyprus (EU), Czech Republic (EU), Denmark (EU), Estonia (EU), Faroe Islands, Finland (EU), Georgia, Germany (EU), Gibraltar (EU), Greece (EU), Greenland, Hungary (EU), Iceland, Irish Republic (EU), Italy (EU), Kazakhstan, Kosovo, Kyrgyzstan, Latvia (EU), Liechtenstein, Lithuania (EU), Luxembourg (EU), Macedonia, Madeira (EU), Malta (EU), Moldova, Monaco (EU), Montenegro, Netherlands (EU), Norway, Poland (EU), Portugal (EU), Romania (EU), Russia, San Marino, Serbia, Slovakia (EU), Slovenia (EU), Spain (EU), Sweden (EU), Tajikistan, Turkey, Turkmenistan, Ukraine, Uzbekistan, Vatican City State. Covers all countries, not defined as being in Europe or World Zone 2. World Zone 1 generally covers countries in North America, South America, Africa, the Middle East, the Far East and South East Asia . Cocos Islands, Cook Island, Coral Sea Island, Fiji, French Polynesia, French South Antarctic Territory, Keeling, Kiribati, Macao, Nauru Island, New Caledonia, New Zealand, New Zealand Antarctic Territory, Papua New Guinea, People's Democratic Republic of Laos, Pitcairn Island, Republic of Singapore, Solomon Islands, Tahiti, Tokelau Islands, Tonga, Tuvalu, US Samoa, Western Samoa. Hexon box sets are delivered by courier, FedEx, UPS, DHL or other. It is important to supply your full postal address and contact telephone number when placing an order. Why? You may need to be contacted regarding the delivery of your order. If the courier calls when you are out arrangements can be made to rearrange delivery of you parcel at your convenience. A tracking reference will be emailed to you so you can follow the progress of your order online. Austria, Belgium, Channel Islands, Denmark, Finland, France, Germany, Hungary, Italy, Luxembourg, Netherlands, Norway, Poland, Portugal, Republic of Ireland, Mainland Spain, Sweden. Rest of the world Please contact us for a quote. The shopping cart calculates an estimate, this could be more or indeed less that the actual cost. Please note, we are not responsible for your order once it has been handed over to Royal Mail or other carrier – a certificate of posting is produced to assure you that the order was handed over to Royal Mail or other carrier.